World’s tallest statue, i.e., a 137-ft statue of Chenrezig, in Sikkim, is set to woo tourists. 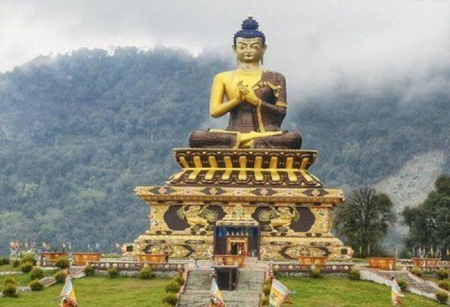 As per the Sikkim Government, this new pilgrimage site in Pelling will feature the world’s tallest statue at an elevation of 7200 m. Sikkim, apart from its picturesque beauty, now adds another feather to its cap with this statue standing tall in the midst of snow-capped mountains. It is part of the Sikkim Government’s policy to promote it as a Buddhist Pilgrimage Tourism Circuit. Tourism Minister Ugen T Gyatso, further mentioned that building the world’s tallest Chenrezig statue and a new complex, replete with a café and a gallery, and a skywalk, has been a challenging task for the engineers because of the terrain.